Diagnostic Features - Antennae 11-segmented. Eyes well developed and situated in the middle of the sides of the head. Ocelli usually absent. Mandibles with five teeth, clypeus large and projecting over the basal borders of mandibles. Alitrunk short, weakly constricted between pronotum and propodeum. Propodeum unarmed. Petiole a reduced scale, inclined forwards and may be overhung by the first gastral segment, never armed or emarginate. Acidopore borne on a conical projection, surrounded by a fringe of hairs. Monomorphic or polymorphic. Mayr's (1861) genus description is at . 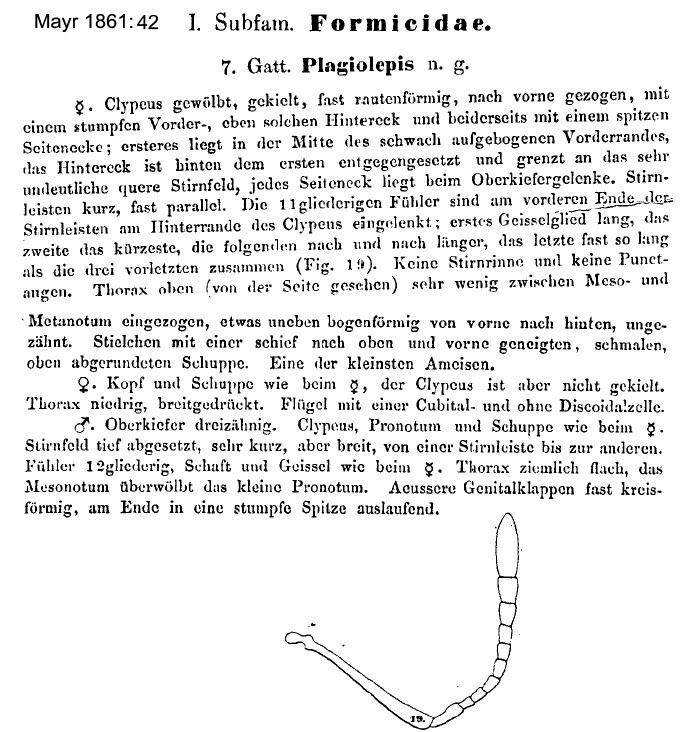 Santschi (1914e: 36) erected the subgenus Anacantholepis for Plagiolepis in which the metanotum is very raised and distinctly separated from a short convex propodeum (he regarded it as an intermediate transition to the genus Lepisiota (as Acantholepis). 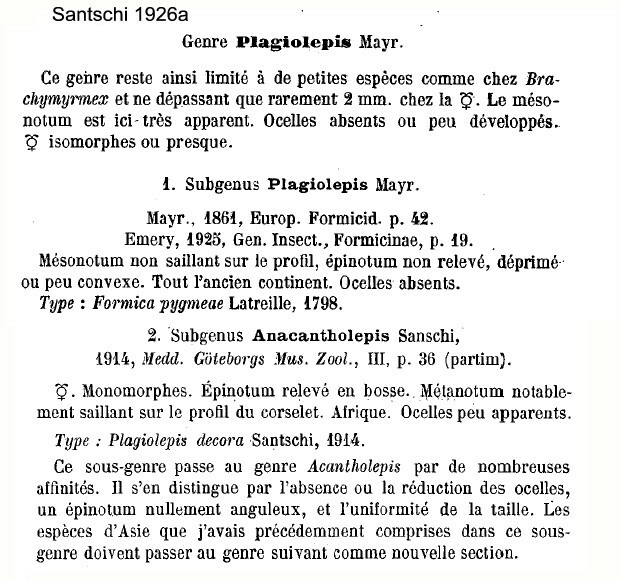 Santschi (1926a) clarified and restated his definitions of the Genus and the subgenera Plagiolepis and Anacantholepis. These are at . Bolton (1995) had "Anacantholepis provisional junior synonym of Plagiolepis; Brown, 1973b: 178 (unconfirmed)". This was asserted again by Bolton (2003: 268), with the added remark that he found it impossible to resolve whether Plagiolepis and Lepisiota - "represent a single genus" or "the mass can be resolved into more than (that sic) two genera". Bolton (2003), however, referred to Santschi's (1914c) definiton of Anacantholepis as "those species in which the metanotum, when viewed in profile, was more prominent dorsally, and the propodeum more strongly convex than was 'normal' in the genus". Bolton continued - "Both these features are marked only in the South African type species, P. (A.) decora, being less well developed elsewhere and intermediate". Simple examination of the descriptions and illustrations reveals that the Santschi separation is very clear for several species and the subgenus appears to fully merit its status. Accordingly, I have returned to the situation prior to statements of Brown and Bolton, neither of whom appear to have given any supporting evidence or to have undertaken a review of the described species. (Hymenoptera: Formicidae). Annales Zoologici, 68 (4), 809-824. Together with P. perperamus Salata, Borowiec & Radchenko, this has dense pubescence on the gaster dorsum. Salata, Borowiec & Radchenko (2018) has "3rd funicular segment quadrate or transverse, much shorter than 4th segment"